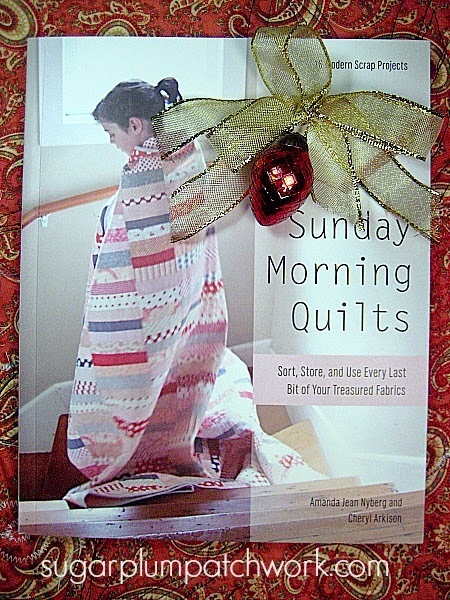 I received a copy of Sunday Morning Quilts by Amanda Jean Nyberg of Crazy Mom Quilts and Cheryl Arkisson of Dining Room Empire as a gift recently and really enjoyed reading it. It's all about scrap quilting - which I love. There are lots of colorful, inspiring quilts in this book if you like scrap quilts. 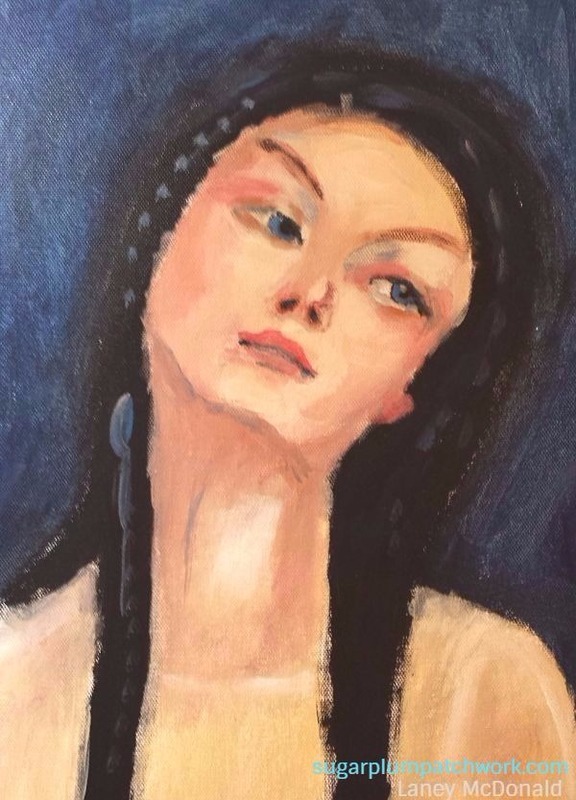 I found the book easy to read and it felt like the authors were just talking to me like a quilting friend. I have not made any quilts form this book but the directions appear to be clearly written. I spent an enjoyable few days pouring over this book when I received it and I highly recommend it! 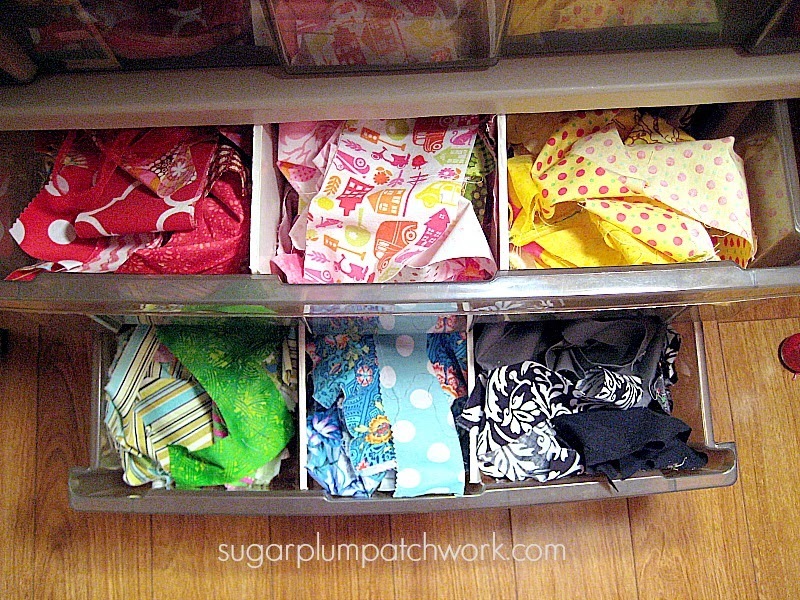 As part of making the best use of your leftover fabrics the authors also discuss organizing your scraps. So that launched me into organizing my scraps as they suggested. And since January is National Organization Month I thought this would be a good time to share. 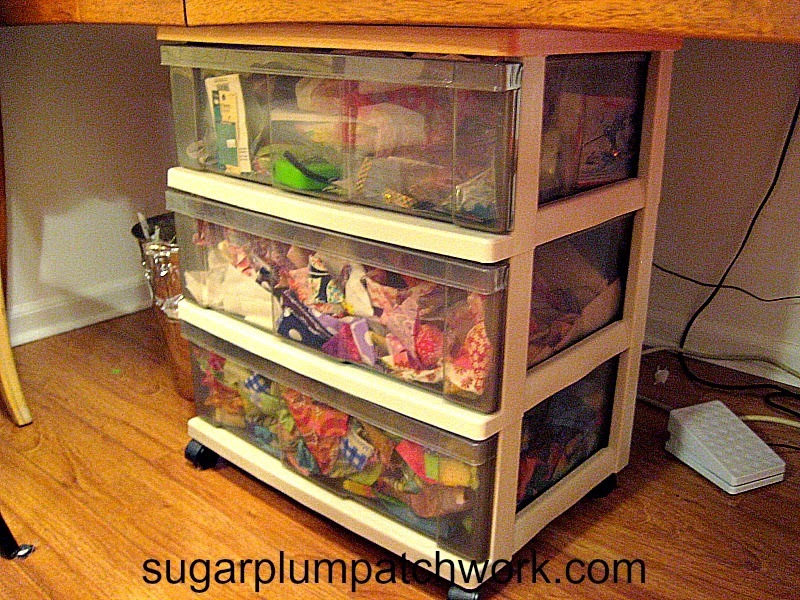 I keep my scraps in a set of rolling plastic drawers which I position under my sewing table. This cart has three drawers. 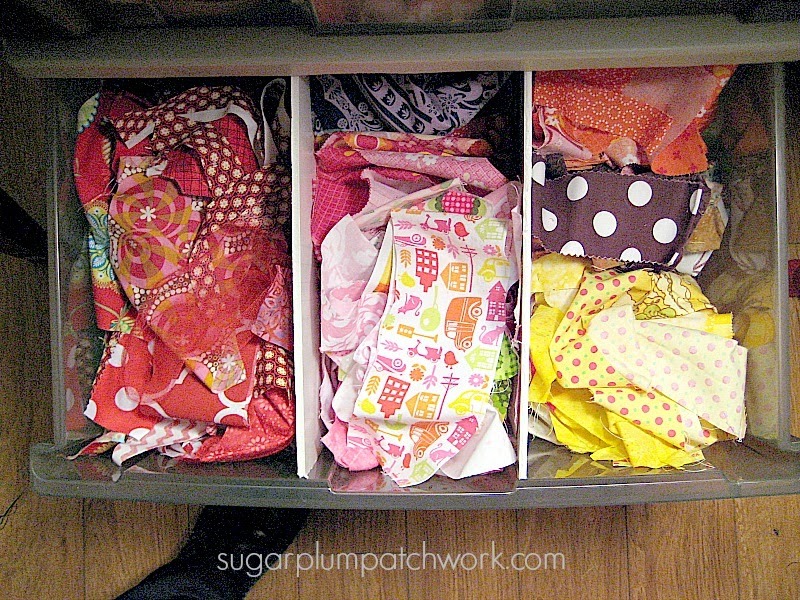 In the top drawer I keep notions and in the bottom two I have my scraps. I sort of kept them separated by warm and cool colors, but I still had to dig around to find things when I wanted a particular fabric piece. The book recommends separating your scraps by color and then further by size. I decided to separate by color first. I still needed to keep my scraps in the same two drawers, so I used some pieces of presentation board that I had hanging around and cut it to fit to make dividers. I cut the board to size and just stuck the pieces down in the drawers. Then I dumped the contents out on the floor and began the separation process! I discovered that I had more usable fabric than I imagined! I saw things I had forgotten about! I found fabrics I thought I had used all of! I realized that I definitely had enough fabric to make more quilts! AND - my drawers look so pretty now! I had to combine some colors so I chose the colors I have less of to share a section - like yellow, brown and orange on the right. I'm not further separating by size. The color separation has really worked for me and I don't want to use further space. When working on my QAYG blocks it's so simple to open the drawer and find a scrap the color I want. I have more studio organization in the works to share later this week. 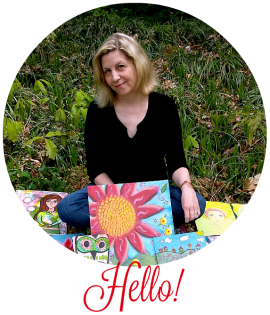 But today check out the Cre8ive Klatch blog for more studio organization tips from a bunch of creative artists! Hope all this inspires you to get organized, too! How do you manage your scraps? Let me know in the comments. I've had Sunday Morning Quilts for a while now, and just finished a quilt that is a variation of Scrapper's Delight. Really fun blocks to make! I hope to make more from this book, and look forward to seeing how you use your scraps, too! Great organization! I'm in the process of doing this also. Feels good to have them all in their places. 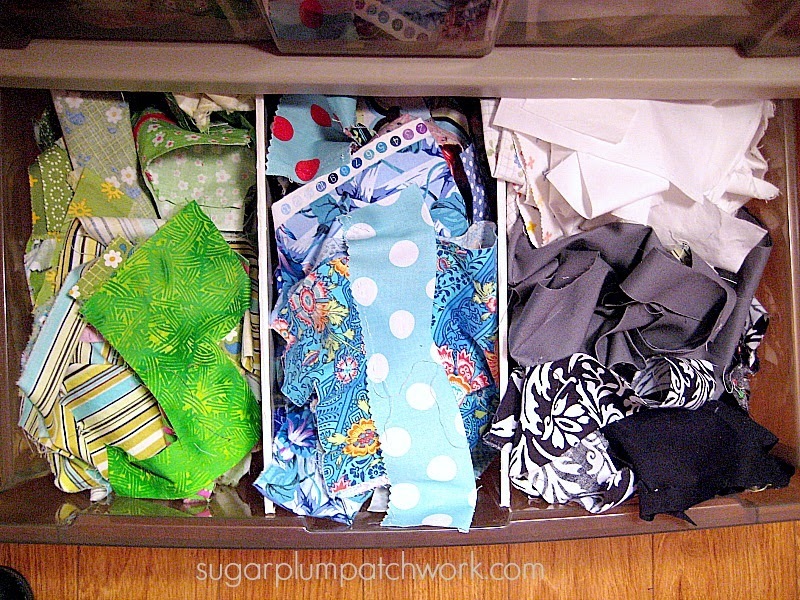 Your scrap drawers look lots more usable now, and it is so pretty. Now how long will they stay organized?! Looks great! Scraps are everywhere in my home- soup pots, cookie jars, baskets! I use a rolling drawer system, too! I have not sorted through my scraps, but just put what's left from a project in a sandwich bag as I go. Your scraps look much happier now! What a great idea to use the boards to separate your colors! I like to keep my scraps separated by colors so I can just grab a container of them and get to work.......yes.....I have containers for each color LOL! That is a fabulous idea. I currently use a paper bag! Not very efficient.